In Criminal Procedure, we discuss the fundamental black-letter rules of criminal procedure most commonly tested on the MBE and in law school. To help you truly learn and memorize criminal procedures, our professional narrator uses easy-to-understand language that organizes the topics in a way that makes sense. We break down the all the basics of criminal procedure, like the Fourth Amendment and Miranda, and we present real-life examples to demonstrate how the rules of criminal procedure apply to hypothetical fact patterns. 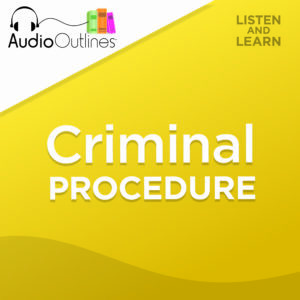 AudioOutlines – Criminal Procedure serves as an extremely simplistic law school supplement and bar exam review rolled into one audio book. It’s a must-listen for all 1L law students and anyone preparing for the bar exam. © 2019 AudioOutlines, LC. All rights reserved.